Tag Archives for " Lana Richardson "
When social media first started being used by businesses, it was all about the numbers – the bigger, the better. Your performance was measured in follower counts or the volume of Likes, Shares, Retweets or Pins you could accumulate. But as social media has evolved to become a core marketing channel, the way we interpret these numbers has changed. As we spend hours every day scheduling Tweets, finding content for Facebook and editing pictures for Instagram, we must be able to determine if the effort is paying off. We need to know whether these numbers are indicative of success and how they correlate with actual business growth. As a brand, counting followers is a ‘vanity metric’ that is not always reflective of success. Although having a large number of followers can be beneficial in terms of your reach, credibility and positioning against competitors, that number is not a representation of how deeply your brand’s message resonates with its audience and is not an indicator of how many sales or leads you are generating through social media. Social media is a marketing channel that requires as much time, effort and often as much spend as the likes of SEO, PPC and email marketing. Its success should, therefore, be analysed and defined in the same way – in terms of business KPIs. When measuring the results of any marketing activity, you require a starting point. Carrying out a detailed audit on your social media channels will help you understand your current performance and give you a position from which to plan growth. Firstly, use each platform’s analytics tools (Facebook Insights, Twitter Analytics etc) in conjunction with Google Analytics to evaluate your strengths, weaknesses, opportunities and to determine who your audience are on each channel. This is of particular importance as audiences can differ greatly from channel to channel. 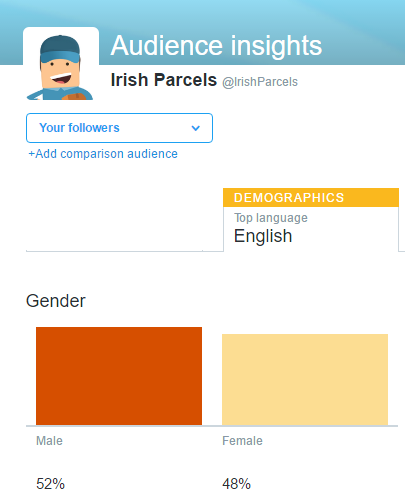 For example, Irish Parcels, an Irish courier company, has a primarily female following on Facebook, yet their Twitter audience is slightly more male. This will not only impact the content you create for each channel but will also affect the goals you set. Take a close look at your best performing content in terms of reach and engagement. Examine the kind of traffic it generates to your website and map the user journey to understand if your current activity is driving conversion. Once you have a well-rounded understanding of where you currently stand in terms of social media marketing, you need to establish realistic and specific goals that serve a purpose and are set around metrics that matter. This will help you develop a manageable strategy that is results-driven. Look at your overall business objectives and determine how your social media efforts can help you achieve them. Perhaps you want to increase brand visibility among the 18-25 demographic. For this, a realistic goal may be to increase Facebook interaction among this target market by 10% month on month. When possible, you should also set attainable goals around direct conversions and set sales or lead acquisition targets. An example of this kind of goal might be: “Gain 20 sales from organic Facebook posting” or “Get 15 sign ups through Twitter traffic”. However, for many companies, and small businesses, in particular, focusing on direct conversions is simply not realistic and social media marketing is a much longer game than Pay Per Click or email marketing. This may instead be something to work towards as you first focus on your boosting your reach and engagement, as these are loyalty building metrics that help cultivate conversions in the long run. As mentioned, social media is a long game and can be difficult to quantify in terms of actual money. But regardless of whether you’re able to gain direct conversions or not, always keep some form of ROI at the forefront of your efforts. Establish a monthly cost per channel in terms of labour hours or spend, if applicable (like Facebook advertising), then outline your results. For example, in August, you may have spent 20 hours on Facebook and gained 10,000 visitors to your website via this channel. You will have to determine what this traffic is worth to you, to decide if you are gaining a return on your investment. Putting an emphasis on ROI ensures that you are fully aware of how much work you are putting in and exactly what you’re getting in return. This prevents you spending more time and money than you need to on each channel and means that everything you do has a purpose. If you’re not measuring, then you’re not marketing, so be sure put time aside each week to review your social media platforms and note any changes, improvements or other results. Each channel has its own analytics tools which provide valuable insight into your content performance and who your audience are. Some will even give you an idea of what time of the day/week is best to post. Don’t just take note of your results; analyse and restrategise accordingly. For example; if you notice that your reach is poor, your marketing message is not strong enough. If your engagement is low, your content may not be specifically targeted and if your conversions could be better, consider rethinking your call to actions. Be sure to measure frequently. Social media is an instant medium and you can determine almost instantly what is generating results and what isn’t. Don’t wait to create a monthly or quarterly report before you change or adapt your strategy. Pay close attention on a regular basis; if something isn’t working, stop doing it. It something is generating great results, find a way to build upon it. Lana Richardson is a journalist and digital marketer, specialising in content and social media marketing. She is the current blog editor for NIParcels.com and IrishParcels.ie.